Grind poppy seeds (see note below). Place in a small bowl, stir in boiling water & let stand uncovered. Place flour, yeast, sugar, & salt in large mixing bowl. Stir in milk followed by oil & egg. Place dough on floured board and knead 100 turns (about 2 minutes). Cover & let rest 10 minutes. Meantime, add ground almonds, sugar, vanilla & zests to poppy seeds. Cover with a towel and rise in a warm spot for 1 1/2 hours or until double in size. Preheat oven to 350° F and bake for 35 minutes. (Another option): Before baking, you can brush with eggwash and sprinkle with poppy seeds. Note: If using a spice grinder (mine is a Cuisinart Spice & Nut Grinder) grind seeds slowly, 2 Tbsp. at a time, until they feel moist – about 10 seconds per each portion. Scoop out any that stick to the bottom of the grinder as you go. Once they are all ground, I use the same grinder to grind the almonds. 88 Comments on "Poppy Seed Roll (Polish Makowiec)"
Made it for this 2018 Christmas, the best holiday sweet bread ever had!….. instead poppy seeds I made it with grounded walnuts+almonds+cocoaPowder+sugar+milk+vanilaPasteExtract+3tears of pure almondExtract. Doing a search for this recipe as my Grandmother made it and haven’t had it in 30 years!! The memories came flooding back!! It will now be a traditional holiday treat for my family!! thank you thank you!! Hello again Jenny. My Mother used to make poppy seed bread, nut bread, and plain. They were delicious. She also made what she called Dutch cake. It was one layer and it had a cream top (not too thick) with fruit like sliced peaches in it. It may have been sour cream. Not one of us (her 5 children) have the recipe. Do you know of this cake and have the recipe? Do you also have a recipe for plain poppy seed bread? The bread was sweet, no icing, and I don’t think she added anything to the poppy seeds. Thanks. I tried this recipe and it came out great!! Wondering how best to store it? Have u ever tried making 2smaller loaves with this recipe? How did u modify to make 2loaves! Thx so much!! I made also your no knead bread, just fantastic! I am so disappointed.,..I want to print the recipes ,only couple I remember from family and each time I try to print from your site that says print, it comes up blank or it prints all the comments people made to you. i wanted the poppy seed roll and the chrustikies…so disappointed…..loved watching you make these. Please see the FAQs for printing issues. Highlight the recipe, then hit “copy”, open your word and paste then “Save As” (I have a folder where I save all copied recipes from Facebook or if I looked up a new recipe and if good to repeat, I put the recipe there. For Jenny’s recipes, I “Bookmarked” since there were so many to try. I couldn’t print it either so I just copied and pasted it to a word document. It worked fine that way. I am going to try this recipe. I cannot find it already made in my area so I will try this. I am not great with dough. 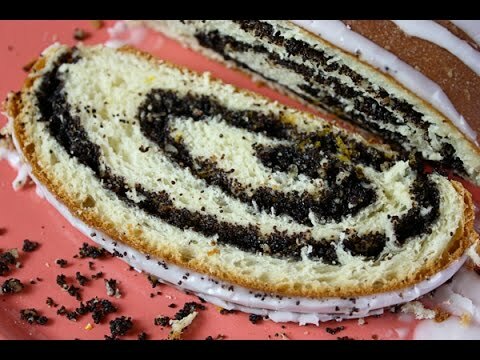 I grew up on poppy seed roll my grandma would make it was so good. HI Jenny – I’ve been looking up recipes for Makowiec and saw your youtube. Some of the other recipes I saw called for boiling and draining the poppy seeds. Do you know why they would want to boil the seeds first. Seems like a lot of flavor would be lost. Historically, maybe it is because some forms of poppy are used to create narcotics. Have you researched any of this? I’m not looking to avoid tiny amounts of morphine but just want to make the best tasting Makowiec. Thanks! Thank you so much! My mom made this every Christmas! I think hers was somewhat different, but it’s helpful to compare your recipe to hers as I am struggling with reading portions of hers. I am wondering if you have ever used the cans of poppysed from the store instead of boiling the poppyseeds and making your own mixture. I think this may be what my mother ended up doing. Would there be a big difference with using the canned poppyseed mixture? I just baked it and it is delicious! Many thanks for this wonderful recipe! It was easy to follow even for this inexperienced cook:)! I wouldn’t use it. Sometimes you have to just bite the bullet and throw it out! I bought instant active yeast packets. Can I still use them or should I get the regular yeast packets? And can I make this the night before I need to serve it? Thank you! I’m making this for the first time for Easter. Yes and yes. I updated the recipe to include both types of yeast. I found a jar of 29 oz of the Poppy Seed filling. How many of those jars would I need? Thank you! I added up the ingredients and I find that jar is just right. It’s about 2 oz over but it may fit in. Even though much of the filling seeped out, enough remained so it tasted good. Everyone loved it. It got a bit too done so will try again and try to seal the filling in better and bake a little less time. Half of the filling oozed out. Haven’t sliced it yet but there seems to be an empty area. i had the same problem half of the filling oozed out but overall it tasted good. I needed this so much! I have to use it for a school project on my ansestrey, and my grandfather mentioned that growing up, as his father was Polish, his mother would always make, as he puts it, ‘A type of sweet poppy seed bread’. Thank you! I grew up looking forward to having these during the holidays when my aunt would come visit from Ohio. Since she has passed no one has been able to replicate her recipe, I can’t believe you have. You have brought back so many wonderful memories of my childhood. Thank you from the bottom of my heart! I made this for Christmas and wow did it ever bring back fond memories. I am fortunate enough to live near a large community of Polish immigrants(my grandparents were all from Poland) and can shop for all my ingredients. The butcher shop actually sold containers of their own poppy seed filling made with honey so I was able to skip making the filling from scratch. Thanks so much! 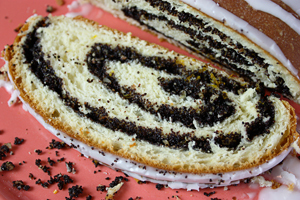 I am looking forward so much to trying your recipe for poppy seed filling. My mother always used the grinder, then added vanilla, sugar, some water, and steamed this over a very slow heat (back of the wood stove). She always claimed crushing the dry poppy seed first was the superior method – had the best flavor. (She was of Romanian-Ukrainian background.) We used this filling for perohe, poppy seed bread, and for adding to cooked wheat. The taste was superb. Followed the recipe and u tube, but when I put the roll into the oven, at 350 degrees, as it was baking, the roll and filling started oozing out the side. I decided to poke holes in the top thinking it would help. It didn’t 😞. What do you think I did wrong? That’s a common occurence with poppy seed rolls and it happens to me as well. You could try pinching the ends together after rolling and also I think sometimes it’s from letting it rise too much. If you search the internet, you’ll find that it happens a lot and you may see some other solutions. Thank you so much for the poppyseed tools. It is part of my past and make it every year it is a memory of my polish heritage ! I am a cook and i want to know how to cook polish foods, so i look at your videos and enjoyed then so much. I prefer walnuts as they are easier to grind and I mix them with egg whites (unbeaten) +/- milk. My old recipe called for room temperature soft butter and 6 eggs. The result were 4 little rolls (I don’t know an English name for these bread rolls). We did these for Christmas or Easter together with some panettone like big sweet bread. I am half Italian and half German. My Italian grandmother made this roll with a walnut filling and called it Colache. My German grandmother made the same roll with walnuts, poppy seeds and a prune filling and called it Kloch. Loved it all. Do you have a walnut mixture to use in lieu of the poppy seeds? This was my Baba’s recipe (Ukrainian) for filling her little kolachki but works in the nut rolls just fine. I’m guessing this is an enameled pot and I have also made this bread in a 3.5 quart Le Crueset. I would say either your oven is hotter than you think or you could move the oven rack up one notch so the bottom gets a little less heat. I use a Tayor oven temp, on the middle rack and it shows the oven temp is right on. However, never thought to move the rack up a notch. Will give that a try. Thank you, Jenny. I have a recipe for nut filling. I am part Polish on Mom’s side and part Ukrainian on my father’s side and my Baba was the Ukrainian cook in our family when I was growing up. She made kolachki, which are small individual filled cookie sized delights made from yeast dough. It was definitely NOT healthy, using lard and butter and heavy cream, but oh my these melted in your mouth. Fillings were walnut, lakvar (prune), apricot, cheese, poppy. My mother’s side of the family was Polish and they made what we just called nutrolls (buchtki) very similar to the makowiec recipe here. I’ve used walnut, poppy, lakvar, and cream cheese fillings for my holiday baking of both of these confections. Here is the nut filling recipe I’ve used for both kolachki and buchtki. Jenny-I enjoy your videos very much and your Polish speaking and stories, too! I found you web site by accident when searching for Polish recipes. I am so pleased that you and your recipes popped up in the search. I live a small Scottish Borders town that is twinned with Zagan in Poland. Our Civic society is organising an afternoon tea for approximately 100 people with guests from Poland and Italy who are presenting our town with a ‘Statue of Wojtek the Bear.’ (see note below on Wojtek’s story). I am helping in preparing the food for the event and we wanted to include some Polish recipes. Hence the search. Your site has been so helpful, especially your cookery demonstrations. Plus you made me laugh. So, along with local food, we will be presenting our guests with Makowiec, Paczki and Pierogi. Wotjek’s story: While in Iran in 1943, Polish soldiers had rescued a bear cub and ‘adopted’ him. They called him Wotjek. As Wotjek grew he was trained to carry heavy mortar rounds. At the end of the war Wotjek – who had also learned how to drink beer – was billeted with his Polish soldiers at an army camp in the Scottish Borders. When the Polish soldiers were demobilised he could not return with them and was taken to Edinburgh Zoo where he eventually died in 1963. A statue of him is being gifted to our town ‘Duns’ from the people of Zagan, Poland. Statues of the “soldier bear” are already on display in Krakow, the Sikorski Museum in London and a bronze statue of Wotjek and a soldier is located in Princes Street Gardens in Edinburgh. So he really was a well know and famous local celebrity. There are lots of links on the web to tell Wotjek’s story in greater detail and also photographs and some film footage of him. Any way. 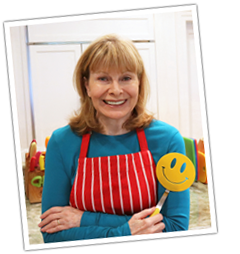 Thank you again for sharing your recipes in such an easy and relaxed manner and adding a good dash of humour. I’m happy to share my recipes and thank you for sharing this story. I made this 2 days ago and it was easier than I expected! The favors were wonderful, but the filling was really loose, so the slices fell apart easily. I did use all purpose flour, not cake flour. I’m wondering if there is a trick to make it stay together better? Tighter rolling? More sugar? Thank you for the fun videos and healthy polish recipes! I’m excited to try them all. The borscht is next! I am taking the easy way out. I just got 3 cans of Solo (brand) poppyseed mixture from Amazon. These used to be sold in most grocery stores. You’d find the consistency correct. Also, Solo makes a nut filling and an apricot filling that can be used…at least, that is what the Croation community where I grew up used to use, with, of course, the poppyseed (my favorite). I hope this helps. I’ve made this bread many times so I don’t think you need to change the recipe. Assuming the followed the recipe exactly, it’s possible you may have measured something incorrectly. If you follow exactly you can see in the video that the filling will not be loose. Let me know if I can help further. Hallo Jenny! I’ve allready made this and it was fantastic. Can I double this dough? I have never doubled this recipe so you would have to try. We’re considering moving to Warsaw, and I’m looking forward to the different food there. I’ve already made some of your recipes, to prepare for my culinary journey. I’ll definitely make this one too. would this work with All Purpose Flour? Yes. I will adjust the recipe to indicate that. And thank you for your simple, easy yet tasty recipes! Why don’t you use the poppyseed filling sold in the stores by SOLO? They’ve been making it for the 50+ years I’ve been baking. I make my foods from scratch because they will always taste better than packaged foods and also because I can avoid all the additives that are in packaged and canned foods. 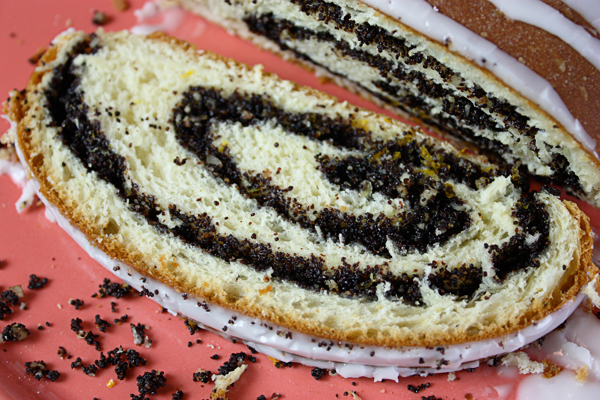 The first ingredient in Solo poppy seed filling is corn syrup. In my recipe the first ingredient is poppy seeds and there is no corn syrup. Sure it’s more work but if you ever make this filling from scratch with the fresh orange and lemon zest, you will see why to me, it’s worth the effort. where do you buy poppy seeds? i was thinking of using the poppy seeds in the can. Do you think it’ll freeze ok? Most breads do.. Cheers. I’m not sure how this bread will freeze considering the filling. I would try freezing just one slice first as a test. Well it burst open a little at the bottom, so we’ll call this the test subject. Which was a bonus cause I got to try some.. And OMG! It’s so soft and beautifully balanced flavours! I’ll freeze some and let you know how it turned out. Thanks again for an incredibly tasty recipe, your instructions made it really simple. The seeping out at the bottom (usually on one side) is very common and happens to me a lot. It’s not always avoidable so don’t be disappointed if it happens again. As long as it tastes good, that’s all that matters. I found my grandmother’s recipe for the dough, but I think it is for multiple rolls. It uses lots of flour and eggs. Then I found what seemed like a sized-down version on a popular website and tried it. It was a flop 🙁 I looked at my husband and said “I should have just tried Jenny’s from the start”. It came out great!! Much larger than the rolls I was used to, but that did not matter one bit. I look forward to making many more of your recipes! Jenny, Would one can (12oz) of poppy seeds be enough for this recipe, should I add the 1/4 cup of ground nuts too? I can’t find fresh poppy seeds and I want to make it tomorrow. Twelve ounces sounds like enough filling. I assume it’s poppy seed filling which contains sugar and spices already but you can probably add the ground nuts but toast them first. I hope it turns out for you without the fresh poppy seeds. If not, you can find poppy seeds online. This is the best! The zest was what I was missing in my previous recipes. You really can cook (though leave the singing to the pros). Thanks! You can use an electric hand mixer or you can mix the dough by hand. If you mix it by hand, you will have to knead it a little longer, maybe up to 200 turns until the dough is smooth and elastic. I made this yesterday and your recipe is fantastic! I’ve been looking for a recipe for 20 years and this is the first one that doesn’t ask for 5-8 cups of flour which is unwieldy. I followed your video and this morning my husband said…..this is delicious…perfect. Kudos!!! Jenny, thank you for your recipes do you know what temperature that I need to bake this in a fan forced oven. Many thanks. If this is what I know as a “convection” oven then you would lower your baking temperature by 25 degrees and probably will have to reduce the baking time by about 25%. So this bread would bake at 325 degrees f. and you should start checking it after about 25 minutes to see if it’s done. I hope that helps. How many slices would this yield? I made…I try…I say….Big Yummmmm! Thanks. buy so much of poppy seeds. Must be also very expensive? And I can not bring this from Slovakia, where they sell it in every store and quite cheap. Thanks for any advice. The spice bottles are too expensive but I found them in a bag at Whole Foods (Bob’s Red Mill) and I found a big jar at my grocery store (Ralphs) and I think it’s their house brand – sorry I don’t remember the name. Penzey’s catalog shows a one pound bag of blue poppy seed at $9.70. i’ll have to get my sister to see if she can buy some there for me. we don’t have Gordon foods here in New York. Another awesome recipe. I saw you struggling in the video with the clear wrap and I couldn’t help but laugh. Sorry, didn’t mean to laugh. I had that same problem and a friend recommended a dispenser. I purchased it and I never had that problem again. Good Luck! Keep the awesome recipes coming!! Also…..who taught you how to cook these wonderful dishes? Are these family recipes? I was exposed to Polish cooking growing up but didn’t pay much attention to the recipes, mostly helping roll cabbage rolls, etc. The recipes are my own from trial and error (lots of that!). As for minis, what a great idea. I have no advice… just divvy up my recipe into what? 3 loaves, maybe 4, and bake for less time.